We attach a lot of importance (and social value) to invention and much less of either to the process by which inventions become part of daily life. Often, the real value is in the innovation although the value is ascribed to the invention – that’s essentially what patents do, and it is why patents are increasingly doing the opposite of what they are notionally intended to. 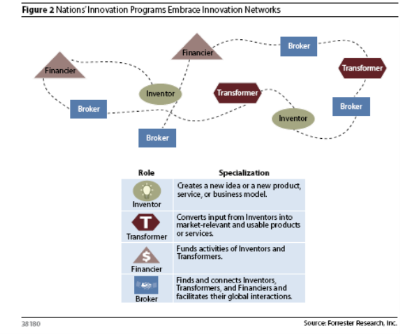 A report from Forrester analyses innovation in terms of four roles – Inventor, Transformer, Financier, and Broker. The report itself comes in at $399, so I am relying on commentary here and here. The Forrester analysis is about countries and in effect seems to be suggesting that they first understand and then exploit and develop the comparative advantage they have in one or more of the four roles. But there’s no obvious reason why the approach should not work just as well at the level of an organisation. For any organisation, change requires innovation, otherwise there is nothing to change towards (and even if that innovation is considered old hat in other places). The Forrester analysis suggests that this will be successful if the process is explicitly treated as a system. The disgram also suggests a parallel with social network analysis – which in turn prompts questions about the proper role of change programmes and their members: is it broker, transformer (or all four)?